A graduate of the Royal College of Art, John Blandy is an experienced artist who works in pastel. He has exhibited his work widely. John Blandy studied at St Martins and the Royal College of Art, and has been represented by Francis Kyle Gallery (1983-95) and Cassian de Vere de Cole (2001-3). Work is part of many collections including Hammersmith Hospital and St George’s Hospital, Tooting. Recent work is painted on site, with an emphasis on the immediate quality of mark that relates directly to the visual source. Blandy works with the idea of a moment in time, making extended series following particular places over long periods. Two projects that are current follow a lime tree in Queens Park and a stream near Oxford. 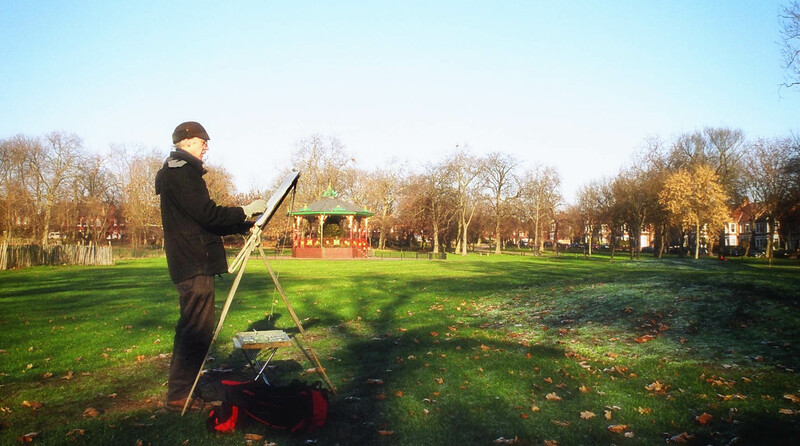 One of the founding members of Brent Artist Register, elected chair in 2003. In 2004 oversaw change of organisation to Brent Artists Resource Company Limited. I paint outside, on site, what transpires on the canvas is reactive; my paintings are my response to the elements, to the place, to the atmosphere at that moment in time. I rarely work inside a studio; everything is created outside, on the spot, in all weathers. For ten years or so I worked for the Francis Kyle Gallery, and they sent me out to numerous countries to follow a journey, to hunt out something to paint I now find that I am in a way watching the changes as they present themselves. Heading home at the end of my daily walk around the perimeter of Queens Park I saw my friend John setting up his easel to paint another view of the lime trees he has been studying for many years, a view which includes our house. 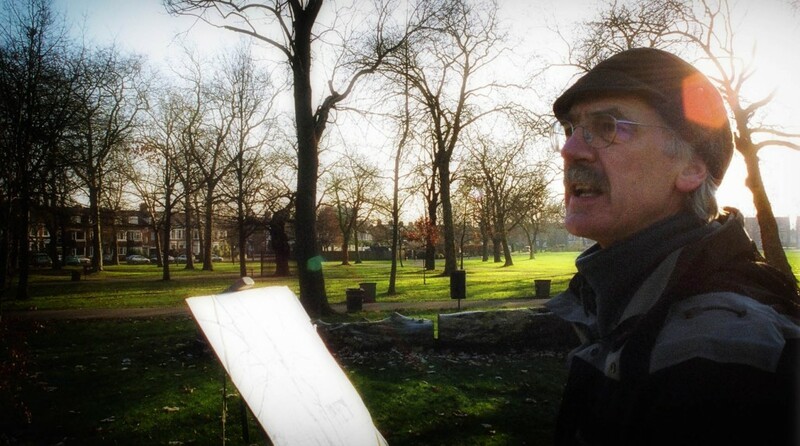 When John appears in the park you know it’s a day of special light and colour. Today, in late October, the air was clear and bright, the morning after gales of wind and rain hit London, the remains of hurricane Gonzales. Gonzales had been weakened by its Atlantic crossing, but was still strong enough to kill a woman in Hyde Park, victim of a falling tree. No trees had fallen in Queens park, thank goodness, though only last year one of John’s three lime trees blew down in a similar storm and an old, red hawthorne tree was flattened. I reached John’s pitch and we chatted. The sun was highlighting reds, yellows and browns in drifts of leaves, victims of the storm, lying under the trees on damp, brilliant green grass. The old trees, mainly chestnuts, planes, maples, and ash, ringing the park, were at the height of their autumnal beauty. The sky was blue with white, still turbulent cumulous clouds. The small, rounded leaves on John’s two remaining lime trees were still in their prime, full and green – they appear only in late Spring and are amongst the last to turn and fall. I described to John a scene in the park yesterday, a moment when the sky to the northwest was dark grey-black, the sun was shining, the trees were heaving in the wind and there was a double rainbow, brilliant against the dark clouds. John too had seen the spectacular rainbows and felt the vibrant atmosphere of the day before. As we talked John said, “There he is, the great spotted woodpecker!” I could see and had heard nothing, but looked up into the lime trees, following John’s gaze. “Are they drumming at this time of year?”, I asked, surprised. Before John could answer a slim, oval shaped bird, black and white with a flash of red, flew out of the top branches of the lime tree, halted in mid air and flew back into the foliage. John laughed. “He did that so you’d believe me”. I too then heard a high-pitched, “Cheep-cheep” way up in the tree and John explained that it was this sound he had heard, not the mechanical drumming a woodpecker makes when building his nest in Spring. We were still looking up into the tree when the woodpecker appeared again and this time he did not hesitate, but flew purposefully up to the top of the park, with a long, looping flight. He flapped his wings energetically, so that his flight path curved upwards, stopped flapping to glide in a falling arc, flapped again to regain height, and in this way, in about four or five long, rolling strides made his way into the trees at the north end of the park. John turned to his easel to start his painting. I watched fascinated as he approached the completely blank sheet of paper, paused, then began to draw confidently. Was it my imagination, or was there something in those first marks, or perhaps in the movements of arm, hand and pastel that echoed the lovely, looping flight of our woodpecker? ‘Following a Lime tree’ film shown at the Lexi Cinema. Al Quds: The Mall Galleries, London. Solo. ‘Artists take to the Forest’; ‘Cities & Water’ at West India Quays Gallery, Docklands; ‘The Piero Trail’; ‘Charleston Revisited’; ‘Route Napoleon’; ‘Mozart’ Lincoln Centre New York; ‘Pilgrim Road to Santiago de Compostella’; ‘South of the Border, Mayan Mexico’; ‘Byron’; ‘Moghul India’ sponsored by India Tourist Office; ‘Moorish Spain’; ‘Ridgeway’; ‘One Great Republic’; ‘Italian Journey’; ‘Now, Fair River’, Cotton Centre London; ‘Ridgeway’, Swindon Art Gallery.